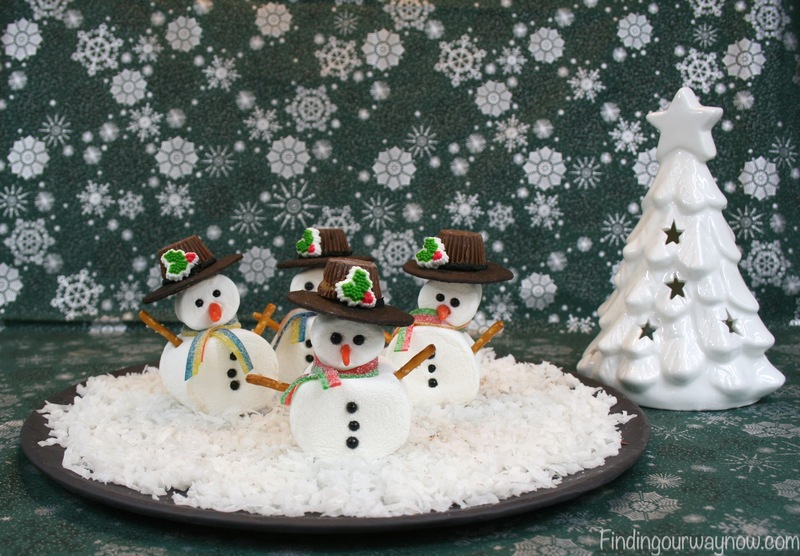 Aren’t these Marshmallow Snowmen Cute? I love doing editable fun projects in my kitchen. Now and then I get an inspiration. I write my idea down and think about what I would need and how it would be best to go about making my idea to life. After I assembled these Marshmallow Snowmen, I couldn’t help it, I just had to share my idea. They are super easy, and they require no cooking, just a little time, and assembly. Scarf: Select a length of the tart candy ribbon, about 6 inches long. Cut in half, lengthwise. Body: Place the Jumbo Marshmallow on the board to find the flat side. On the front of the marshmallow, push a toothpick in and pull it out to create a hole where the buttons would go. Push the small black candy pearls in the holes. At the top, push a toothpick in and pull it out to create a hole where the head would go at a later time. Head: Place the regular Marshmallow on the board to find the flat side. Push a toothpick create a hole where the two eyes and the nose would go. Push the small black candy pearls and orange candy piece in the appropriate created holes. Create a hole at the base of the head for later assembly. Hat: Place the flat side of the chocolate wafer facing down on the cutting board. Squeeze a small dab of black icing in the middle on top and of the chocolate wafer. Place the Reese cup on top and gently press down so the icing oozes out to create a hatband. Place a dab of white icing on the hatband and press the candy holly piece in place. Assembling the Snowman: Gently insert a pretzel stick into the hole at the top of the body about half way in. Squeeze a dab of white icing around the base of the inserted pretzel. Gently but firming, push the head on the body’s pretzel stick into the hole in the base of the head until the head and body are connected. 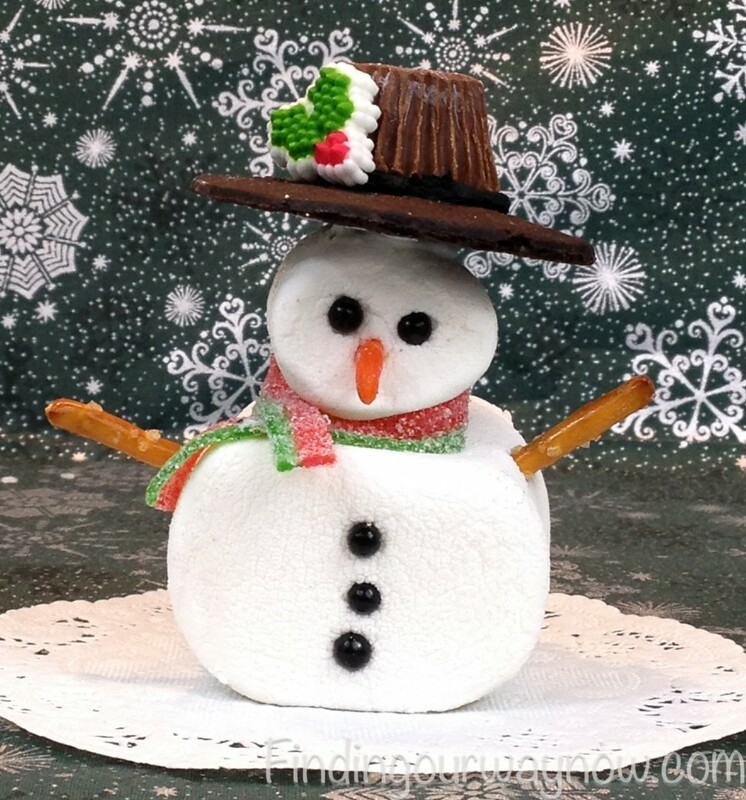 Create a hole with the toothpick on each side of marshmallow body where the snowman’s arms would go. Cut a pretzel stick in half and gently but firmly push each half into each hole for the arms. 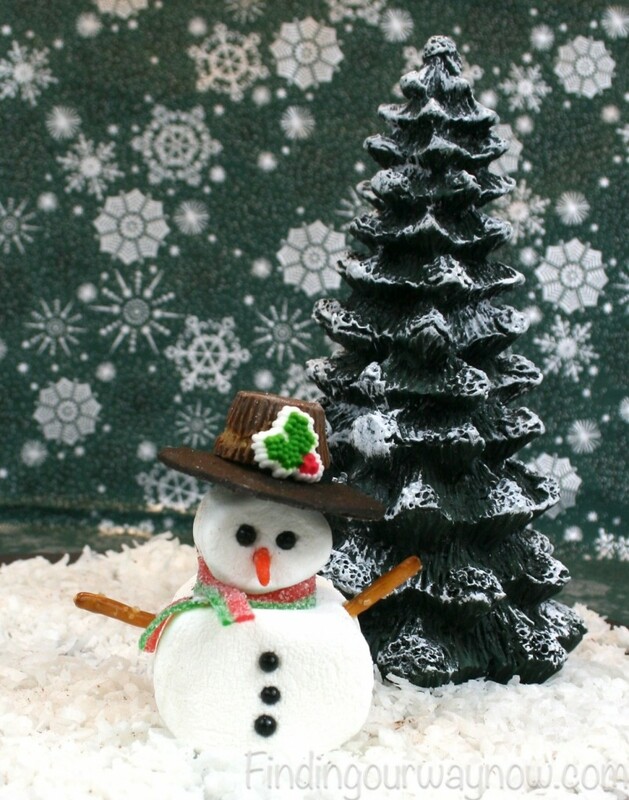 Place a few dabs of white icing around the neck of the snowman. Wrap the sour strip around the neck of the snowman. Place a dab of white icing where the strip overlaps and press. Cut off the extra length of the strips. Place a nice dab of white icing on top of the head and press the hat into place. Final Step: Place each completed snowman on a tray in the refrigerator to allow the whole piece to set. You can place them in a cupcake or cake holder to keep fresh. Notes: It’s important the complete each step in the order presented. It makes this fun project go much more smoothly (believe me). I use pretzel sticks as connectors so that the whole thing is editable and for safety, especially with little children. For ease, I use the cake decorating icing in a tube. 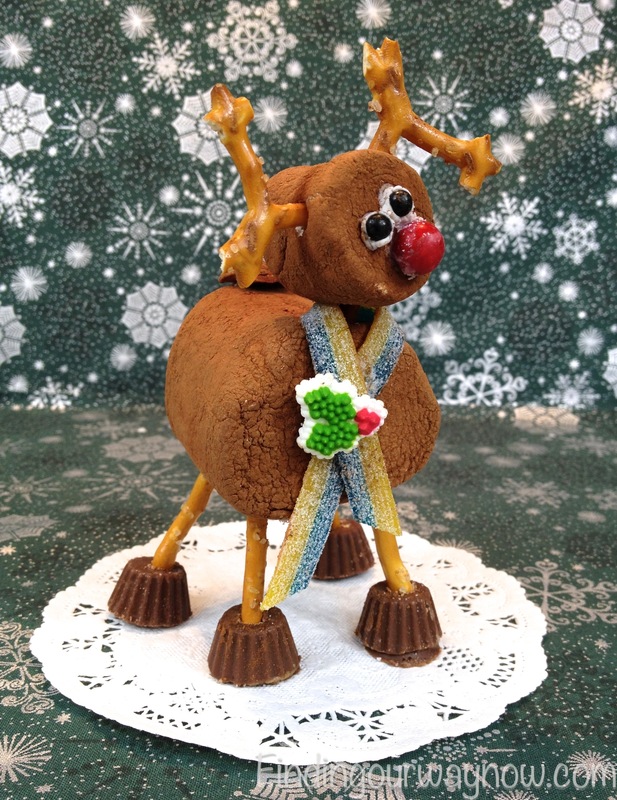 To make the carrot nose, I use leftover Halloween candy, candy oranges slices or jelly beans and cut and gently roll the pieces into a carrot shape. If you don’t want to use the tart candy ribbons, you can use a regular curly ribbon instead. These may sound complicated, but they really aren’t. I just wanted to provide detailed instructions to make sure you would have the best opportunity for success and provide an easy way to go about assembling these cute Marshmallow Snowmen. 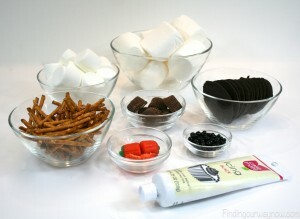 These Marshmallow Snowmen would be a great project to do with your kids or grandkids, heck any size kid for that matter. 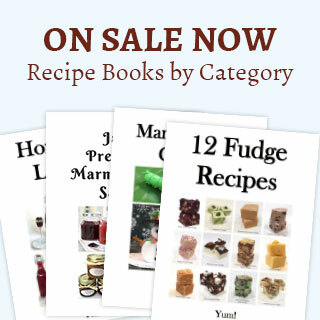 They also make great gifts from your kitchen, or can provide a fun an editable centerpiece for your table. So make your list and check it twice and have some fun. 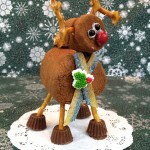 If you enjoyed these Marshmallow Snowmen, check out some of my others such as the Marshmallow Bunnies, Halloween Spiders & Gift Idea Recipes From The Kitchen.